The world's largest solar power plant, now live in Morocco, will eventually provide 1.1 million people with power and cut carbon emissions by 760,000 tons a year. "With this bold step toward a clean energy future, Morocco is pioneering a greener development and developing a cutting edge solar technology," Marie Francoise Marie-Nelly, World Bank Country Director for the Maghreb, said in a statement. "The returns on this investment will be significant for the country and its people, by enhancing energy security, creating a cleaner environment, and encouraging new industries and job creation." On the left, phase 1 of the Noor Concentrated Solar Power plant is generating energy. On the right, phase 2 will be completed in 2017 and phase 3 in 2018. 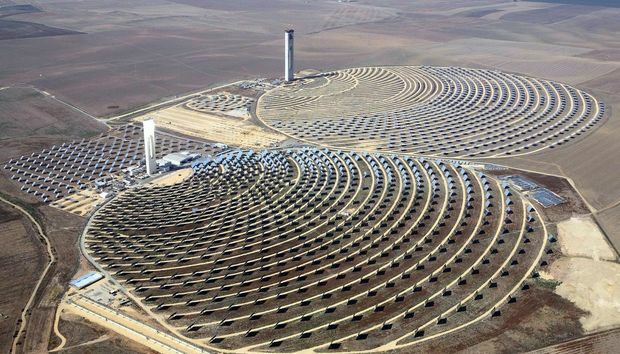 Overall, the new Noor CSP plant will increase Morocco's energy independence, create 1,600 jobs during construction and 200 jobs during the power plant's operation, and increase the installed capacity of solar power stations from 22MW in 2013 to 522MW in 2018, according to The World Bank. The plant will be able to store solar energy in the form of heated molten salt, which allows for the production of electricity even at night. One of the parabolic mirrors at the Noor CSP. Unlike concentrated photovoltaic solar power, CSP plants do not create electrical current through the photovoltaic effect, where particles of light (photons) break electrons free from atoms, generating a flow of electricity. Instead CSP uses either lenses or parabolic mirrors to concentrate the sun's light onto a small point where water or another substance is heated. The heat is used to create steam, which runs a turbine that produces electricity. In the Noor CSP, concave mirrors focus on molten salt, heating it anywhere from 300 degrees to 660 degrees Fahrenheit. Much like the Noor CSP, the Ivanpah Solar Electric Generating System is a concentrated solar thermal plant in the California Mojave Desert. Currently, the Noor CSP can generate 160 megawatts (MW). But as additional phases are completed, in two years it's expected to generate more than 500MW -- enough power to meet the needs of 1.1 million Moroccans. Phase 2 (Noor 2 and 3 plants) are due to open in 2017 and 2018 and will store power for up to eight hours. In all, the Noor CSP plant will cover an area of 6,178 acres. 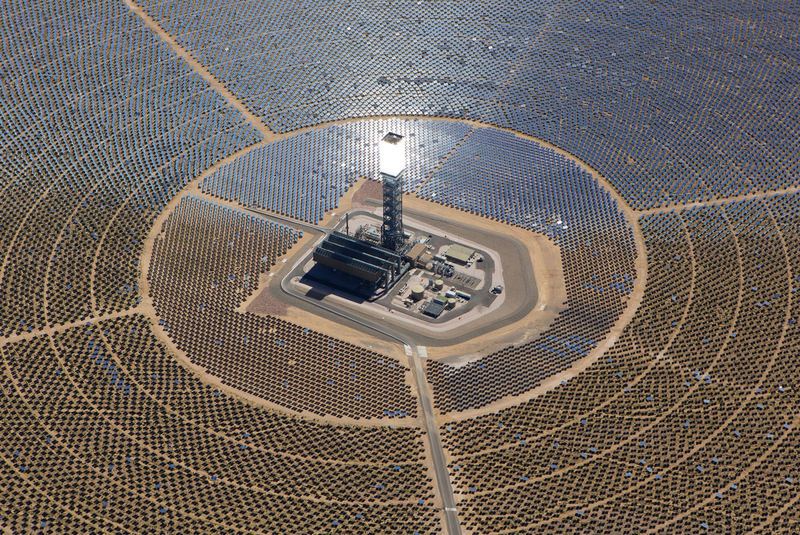 The Ivanpah Solar Electric Generating System is a concentrated solar thermal plant in the California Mojave Desert. Like the Noor CSP, sunlight is concentrated onto a tower containing molten salt. At full power, the new solar power plant will reduce carbon emissions by 760,000 tons per year, which would equate to 17.5 million tons of carbon emissions over 25 years, according to Climate Investment Funds. The International Energy Agency estimates that up to 11% of the world's electricity generation in 2050 could come from CSP. Morocco's goal is to have 42% of its energy come from renewable resources by 2020.